Truth be told, One Piece has never been in my “top anime” list, though this is not the place for that particular write-up. 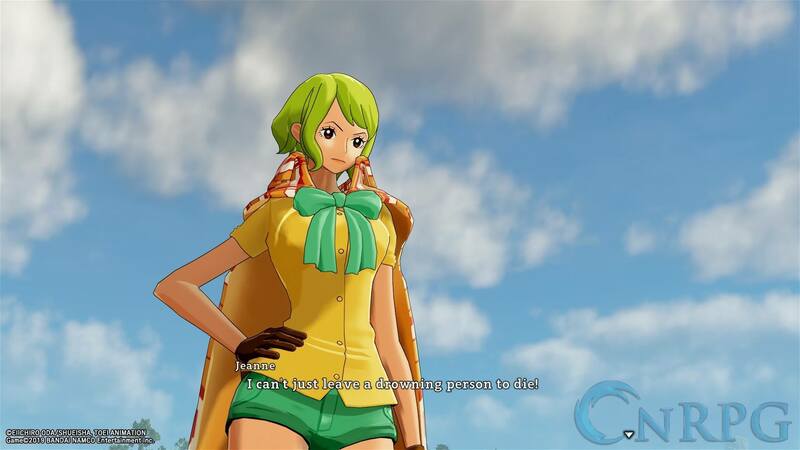 That being said, One Piece World Seeker has been charming enough to convince me to give the series another shot. 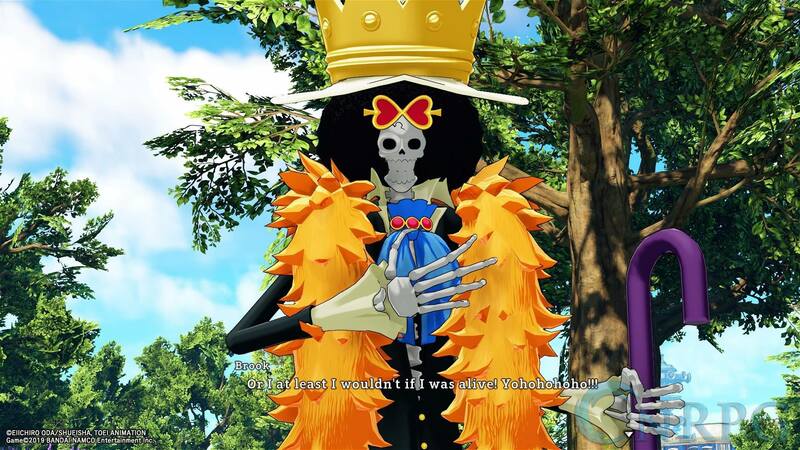 The story being written by Oda himself does a lot for me, adding legitimacy to the game. 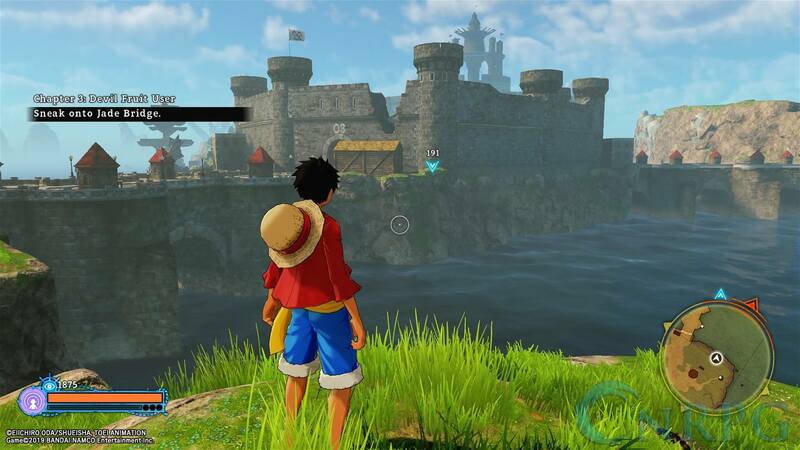 With that, I wonder if World Seeker is officially canon, and if so, where does it fit into the present timeline of One Piece? Perhaps someone that knows more can help me with that. 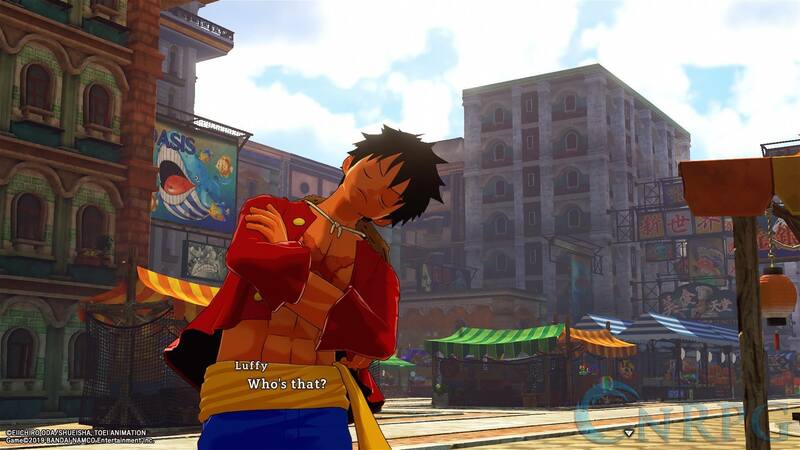 I’ve played a few of the One Piece games over the years, and before this, my favorite was probably One Piece Musou 3. 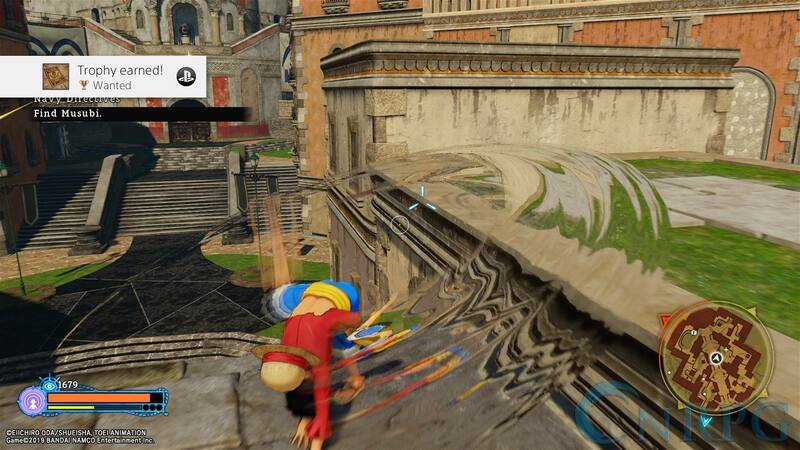 It was filled with hordes of characters to pummel, with all of the cool One Piece characters that I wanted to play as. However, the focus here is on Mugiwara Luffy, with the rest of the Straw Hats as supporting cast. They help him craft new gear, costumes, food, and ultimately (hopefully) save Prison Island. Somehow, we crash at Prison Island and have to fight bunches of Navy officers to save these poor oppressed people. Without fast travel, this could take ages to traverse. I will say that the island is absolutely massive. Thankfully, if you’ve been to an area, you can fast travel back, provided you aren’t in combat. 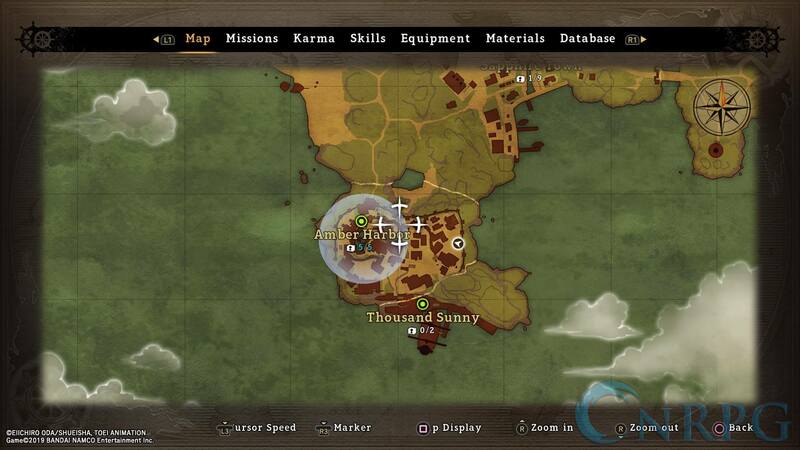 That makes traveling through the areas to get to side quests much easier, the longer the game goes on. 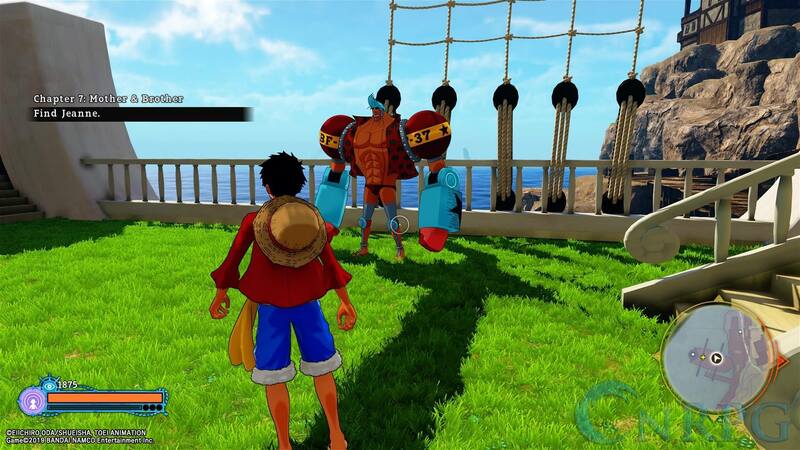 Luffy thankfully isn’t restrained by a Stamina meter, and can just run forever, but it makes it hard to stop and talk to NPCs as well as pick up chests. That’s one minor nitpick – activating treasure chests having a meter, and it can be hard to stop and start activating. So, the Straw Hats can’t leave the island, because 1. they’ve all been captured, and 2. the Thousand Sunny has been damaged. We learn about the plight of this island, controlled by the Navy, and they even explain how Luffy can be harmed by the Navy weapons. There is a particular material their bullets are made of, that can even harm the Devil Fruit users. I appreciate this because otherwise, Luffy would just batter almost anything and anyone in his way. 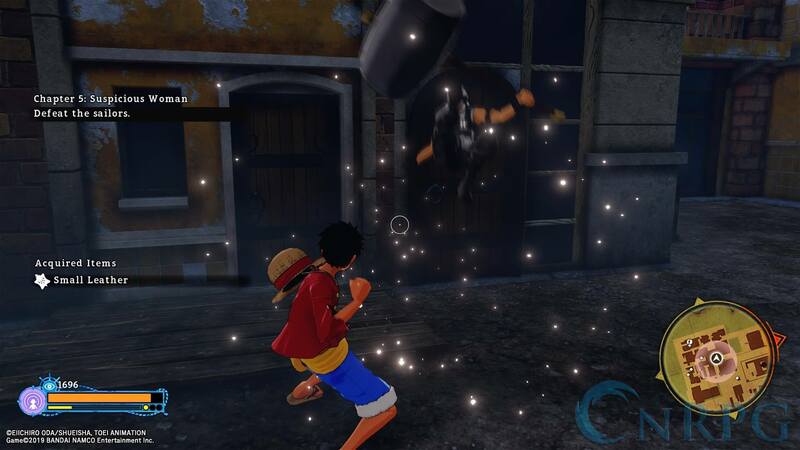 Luffy is pretty damn strong though, and I’m glad that he regens at a decent pace. 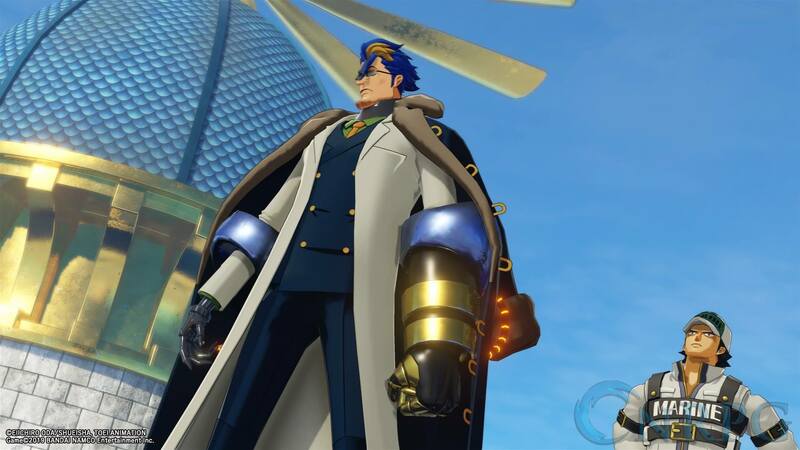 He doesn’t have to keep track of tons of restorative items and use them in battle. This is it – the best line of written dialogue in the game. You’re going to spend a fair amount of time fighting the Navy since practically half of the island is controlled by them. You have a few forms to change between, which are changed by hitting up or down on the D-Pad. Each has its own strengths and weaknesses, but I personally stick to Observation Haki (the speed form). He also has the Armament Haki, and later he receives his Gear Fourth Transformation. For the most part, I just dodge and bludgeon everything, no matter what. The only time I have any trouble in a fight, it would be the larger Navy soldiers with the Gatling guns. They were incredibly hard to get in on, and I would lose so much health trying to get to them. But even the elites and bosses are super easy. 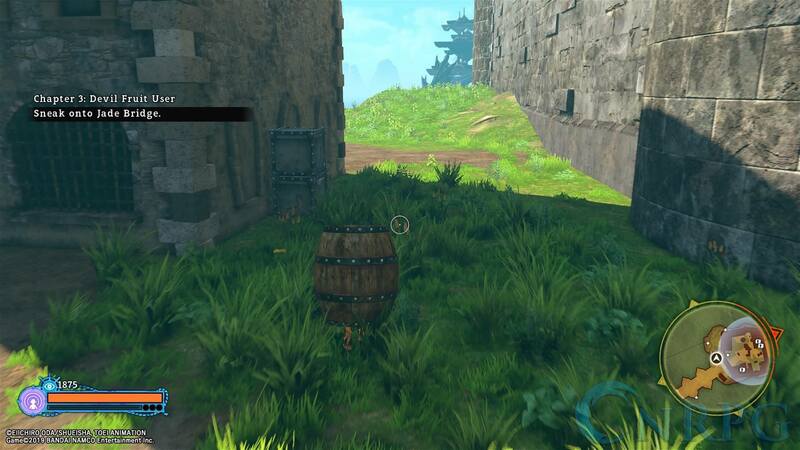 If you want to avoid battle, you can leap into the occasional barrel, but that’s no fun. Get in there and pound those Navy chumps! Just bop ’em in the back of the head! Just build up your Tension Meter by punching their cronies into custard, hold L1, and use one of your Battle Powers. For me, that was typically Gum Gum Red Hawk (Luffy rears back and pounds his targets with a gigantic fist). 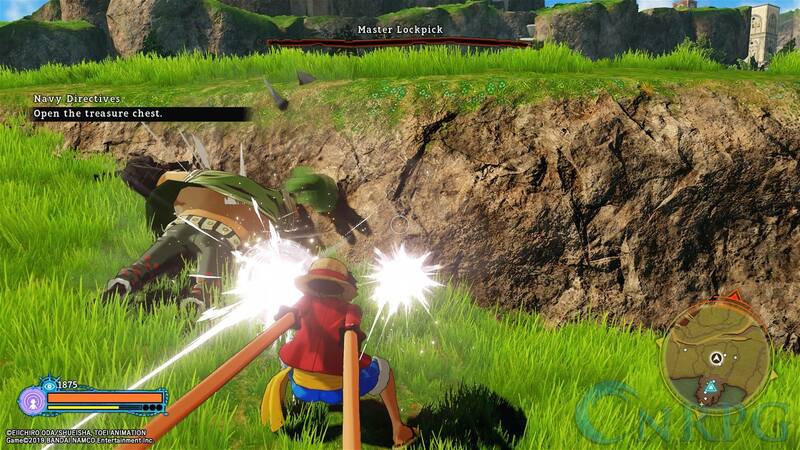 Combat is easy, but it makes sense that Luffy isn’t overwhelmed by anything that comes his way at least. The robot encounters can be difficult too though if they’re in large numbers. Learning to dodge efficiently will be a godsend. Enemies can typically hear you coming, and you’ll see their Yellow Symbol change to Red when they’re actively hunting you. If you sneak up on Navy troops, you can stealth kill them, and will even gain ways to a takedown from below or above, with Skill Points. This is a game where I’ve actually been able to Stealth Kill, which made me terribly happy. 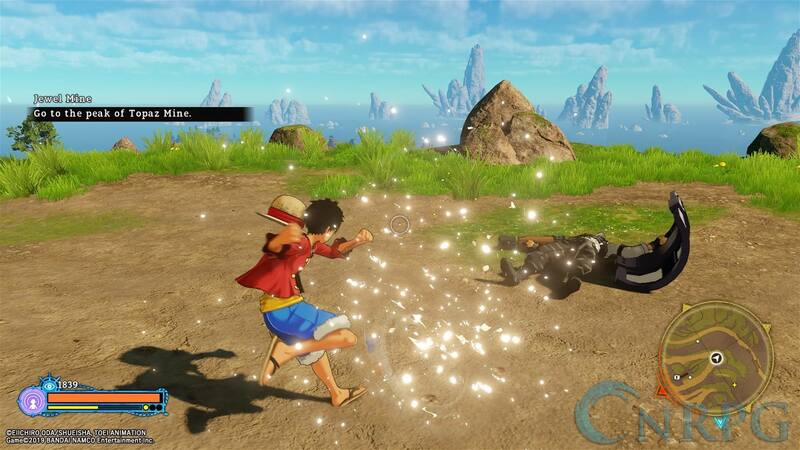 One Piece World Seeker also has a ranged combat option for Luffy, but it’s honestly pretty pointless without a lot of SP invested. The only time I find myself using it is to break tracking systems inside the Prison. It’s a neat idea, but not one that was fleshed out well. Other than grinding missions, SP is incredibly scarce. Alongside combat are Skill Points (SP). You receive SP from combat occasionally, either 1 SP or 10. This is very disappointing, since the cheapest skill is 100 SP, and they can also cost upwards of 400 SP for higher levels of powers. 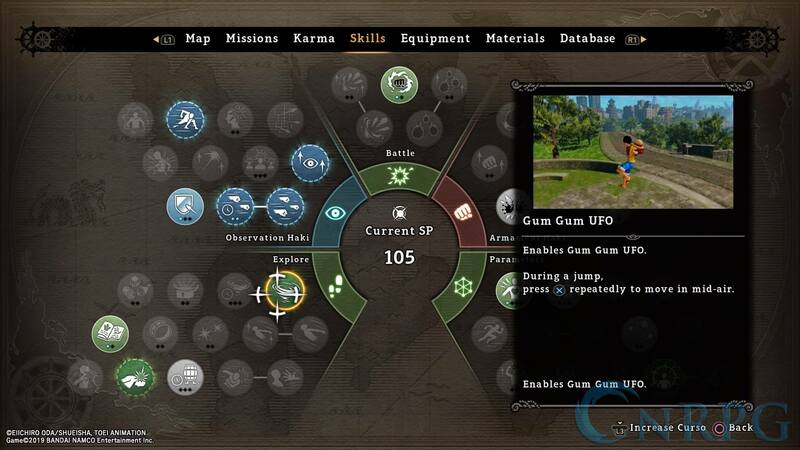 Side Quests and Main Story Quests, however, will be the major source of your SP. I was hoping battles would give a slightly more reliable source of SP, but at least there are plenty of Side Quests and Missions to go on. If you’re hoping to grind through battle though, I hope you’re ready for disappointment – it’s coming. You have your Exploration Skills, Observation Haki Skills (fast, dodgy style), Battle Skills (powering up your combat powers), Armament Haki (the slow, punchy style), Parameter Skills (increase health, et cetera), and Gear Fourth (giant flying Luffy). This will let you fly around and do cool things in the world, but it does have a limit, much like in the anime. Ultimately, combat is fun, typically short, and explosive. But this leads me to one of my few major complaints. This huge city still feels empty and sad. Prison Island, while nice and big, feels incredibly empty. There are a few NPCs in each town to talk/listen to, but the world just feels mighty empty. Even in the biggest towns, I might see one NPC on a street, but that’s it. This does not feel like a wide, expansive island worth exploring. The Straw Hat Pirates are fleshed out, then there’s Jeanne, but far and large, the world feels empty. Another thing I noticed, is they use the Yakuza style of early game – that is to say, the first few chapters of the game are insanely quick to get through. 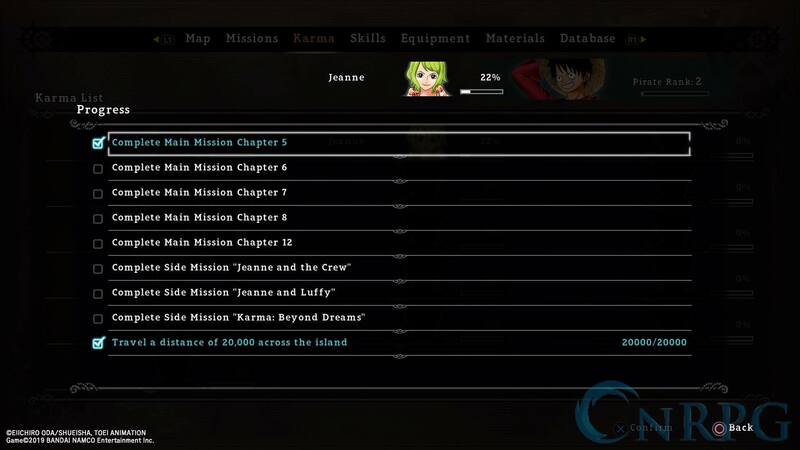 Once you hit Chapter 6 though, the game opens up, you have all your friends with you, and it’s time to do side missions, build up Karma, and save this island from the tyranny of the Navy. I still have so many people to meet and run errands for. The Karma System is one of the cool things about this game. 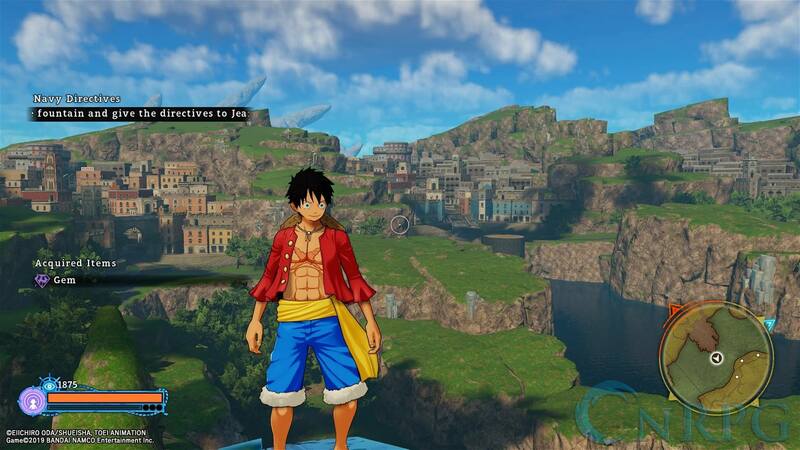 As you meet more characters, from the Straw Hat Pirates to residents of the island, you can go to the “Karma” part of your menu, and see where you stand with them. By completing certain requirements, you can unlock more side missions, and perhaps even unlock some cool cutscenes! Thankfully, once you have met these people, you can click on them in the menu to see exactly what you have to do to increase your Karma with these characters. It looks like some of this will bleed into the post-game. At some point in the game, you’ll reach a “Point of No Return”, where you can’t go back and work on Side Missions. 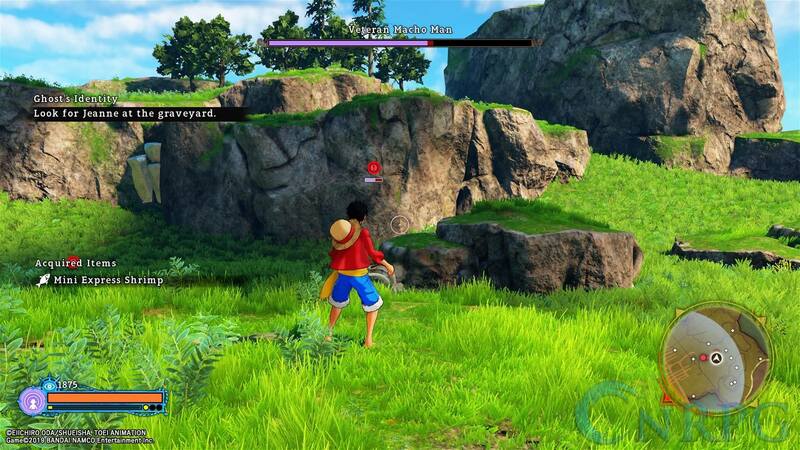 Once the game has been completed, however, you’ll be dropped back on the island, and you can go right back to work, so you really can’t miss anything in this game, unless you simply don’t find it. The green mark is an indicator of where you can Fast Travel to. It’s easy to see Side Missions, Key Missions, and where you need to go in the world. There are nice big symbols, and the compass for your minimap will track where you’re heading. You can change what mission you’re tracking at any time by going to the Mission tab. Speaking of tabs, I’m a little curious about the Equipment system. 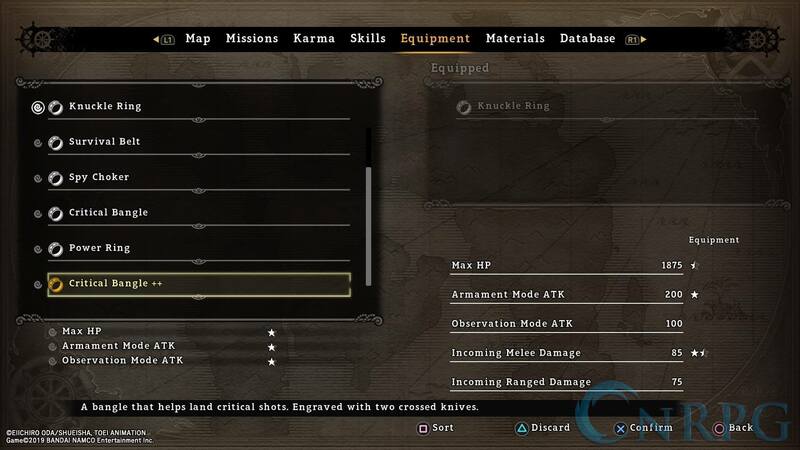 You can equip various types of bangles, but only one at a time that I have seen. You have a chance to craft rare versions of them (indicated by +/++ on the item name), and can also cook delicious foods, thanks to Sanji. There are lots of crafting/food materials throughout the map, which you’ll learn about in the tutorials. It’s generally worth it to go out of your way to get treasure chests and materials in the open world. Many of the Side Missions are just fetch quests, but in nearly every instance I already have what they’re looking for. Take the time to explore, it’ll cut some of your time down on Side Missions. I’ve decided though, this game very much feels like Anime Batman, and that’s not really a knock, just a statement of fact. 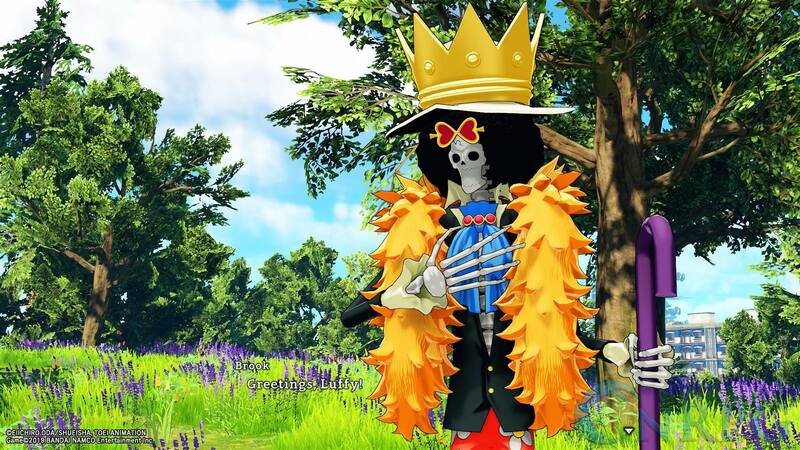 Plus, Brook is here. What bad could come of that? Get ready for the “best” jokes! 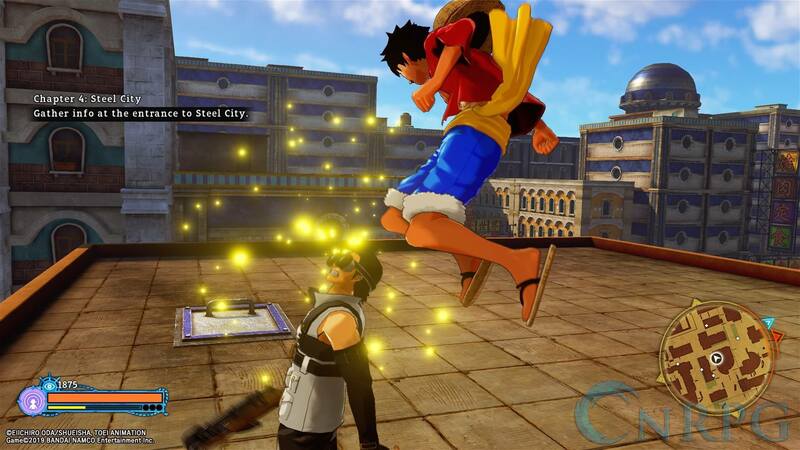 Luffy uses his stretchy gum-gum powers to grab onto ledges and swing through the air, like Batman and Spiderman. 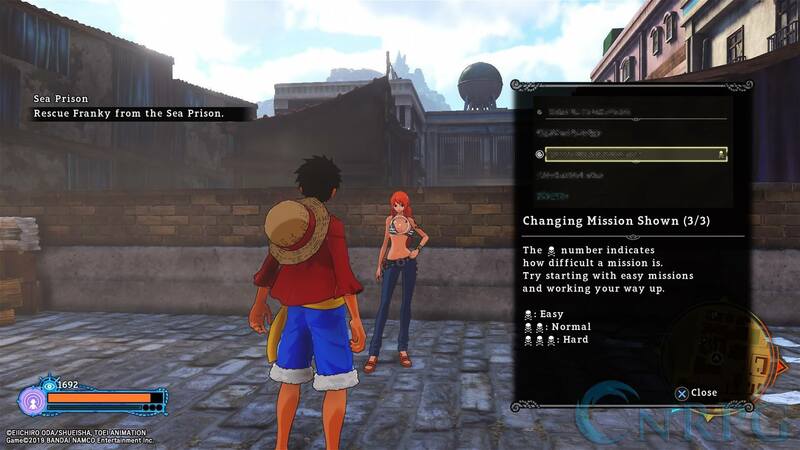 It’s key to the exploration of the game, and I’ve heard a lot of people complain that you can’t play as more than Luffy. With the engine they’ve created, that just wouldn’t make sense. 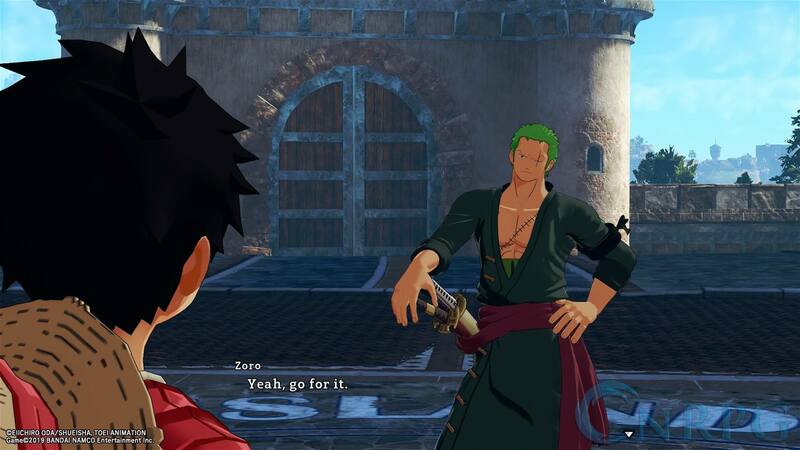 As the only stretchy person in the crew, it probably would have really extended the development time to make new ways to get around for Boa Hancock, Brook, Sanji, Zoro, or anyone else in the cast. I’m fine with this being Anime Batman because it’s done well, for the most part. I wish Luffy could grab onto rocks and other things in the wild. 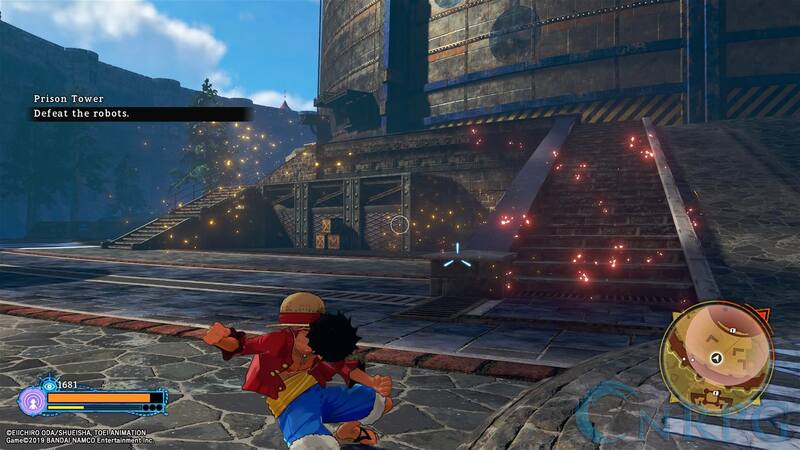 In the wild, you’ll have to rely on a weak double jump, and having access to Gum Gum UFO – Luffy spins his legs wildly to hover. 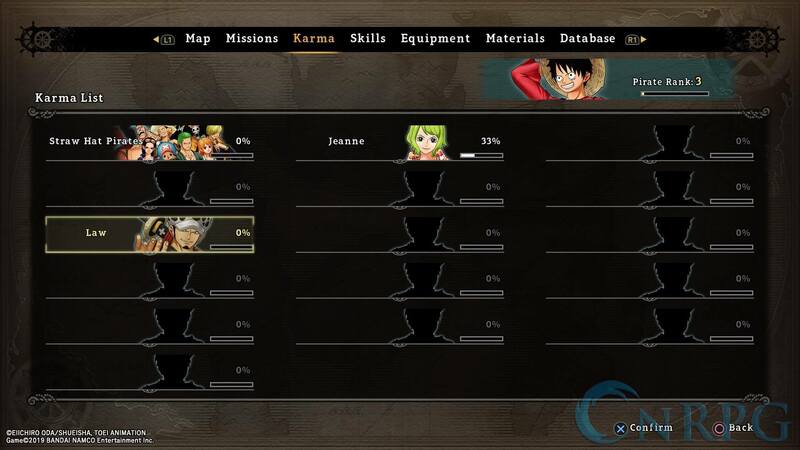 Between this and his dash (circle), that’s how you’ll get into certain areas, without Gear Fourth anyway. It can be a little difficult to jump/dash and grab onto platforms without speeding up the motion of your camera, but that makes me pretty ill after a while. One more complaint about the controls, you can target enemies by hitting Left/Right, but you don’t stay locked onto them. You still have to target them with the camera and run them down. This is definitely a game that would be served well with a camera lock. 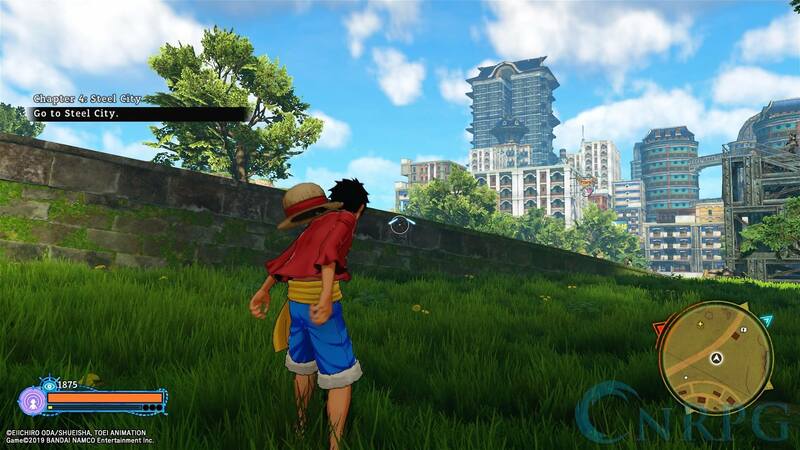 One Piece: World Seeker is an enjoyable One Piece experience. It’s a great first try for modern consoles to create an open-world experience. 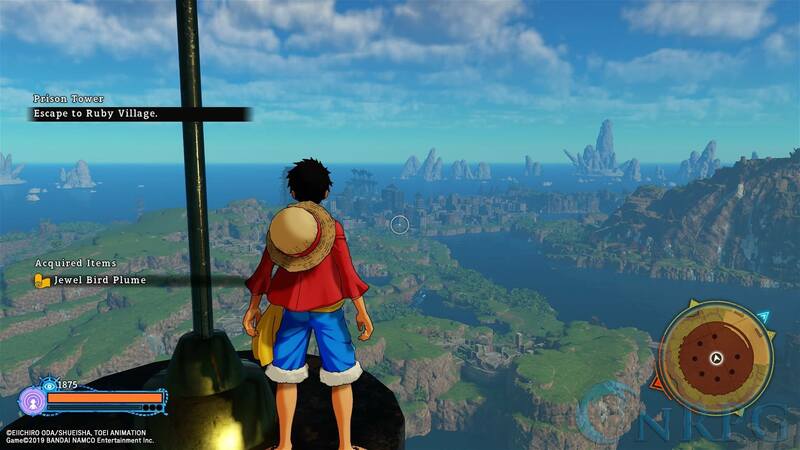 It’s still the best open-world One Piece game I’ve experienced, and I think a second try will probably fix a lot of the minor gripes I have with it. I think only die-hard One Piece fans will latch on to this, if for no other reason than the story. The story’s compelling, and it’s written by Oda himself. It’s been fun and enjoyable enough to get me to try watching One Piece again, so that says a lot with how stubborn I am. I loved the combat, but feel the world is pretty damn empty. Many of the jumping/grabbing puzzles can be incredibly disorienting. The camera has a tendency to freak out while trying to run and jump through some of the high buildings, and if you can’t turn the camera quick enough to grab the next ledge, you plummet back down to the ground. The difficulty is reasonable, and if you should find it too difficult, you can turn it down at will (or up, if that’s your thing). 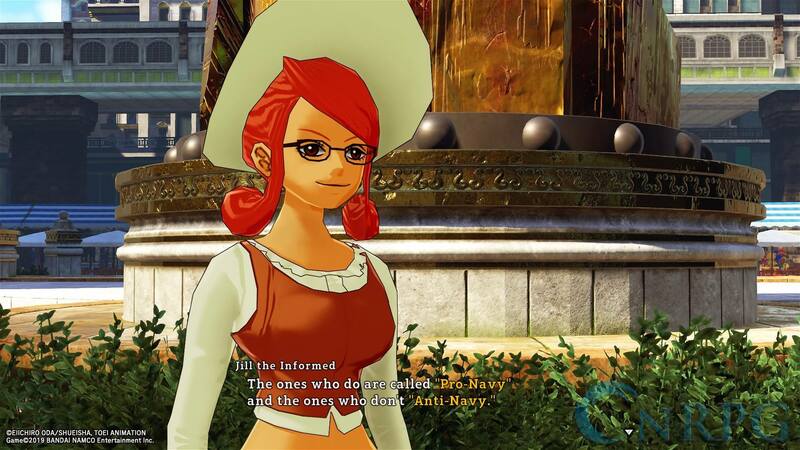 It’s definitely fun to play as Mugiwara Luffy, and everything feels authentic – from Brooks puns to Sanji’s thirsting over every pretty girl in existence. 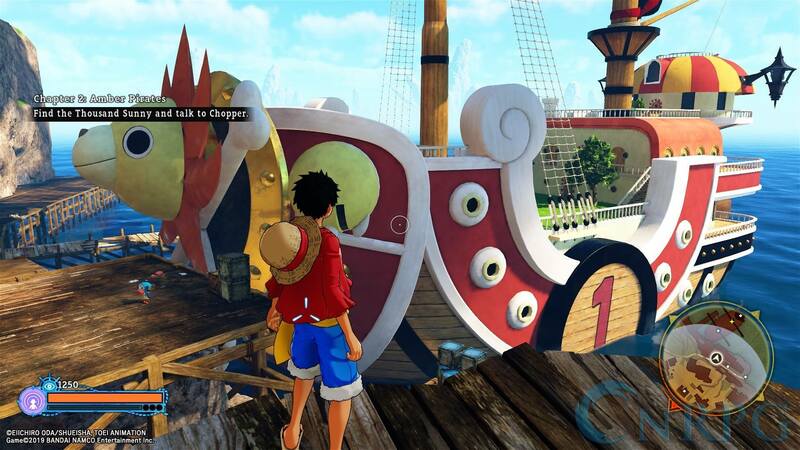 It’s not a terribly difficult game – unless you crank it up – but it is an enjoyable One Piece game. It’s far from perfect, but I still had a lot of fun.